model prayer that Jesus gave us. It can be found in its entirety in Matthew 6:9-13. Most of it is also found in Luke 11:2-4.
could be two separate occasions. In Matthew 6, Jesus is teaching on prayer. In Luke 11, someone asks him to teach a sample prayer. Yet it might be the same occasion. The two writers may just be leaving out details that would easily show they are the same event. The words to the prayer are in red. In the beginning of the Lord's prayer, we see that Jesus is modeling the idea of giving God praise as we begin our prayers. The beginning gives us an example of beautiful praise. There is no rule being set here on how every prayer must begin. In fact, we all know that “Help” is a prayer that is welcomed by God. The Lord does not require that each prayer have a beginning in praise. Nevertheless, it is showing respect to God, and it does position our mind to focus on the awesome and powerful One we are talking to. Previous to this prayer, Jesus had mentioned God as Father several times in earlier verses in Matthew chapter six. To most people today, hearing God called “Father” is not surprising. Most of us know that God wants to be viewed as our Father. Yet, in that day, it was highly unusual. 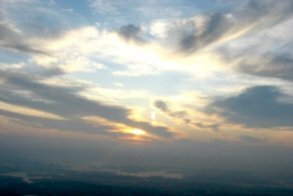 Even though the Old Testament did teach the concept that God is our Father, it was not a common place revelation at that time. Therefore, when Jesus called God - Father - and prayed to him in such a personal way, it was a new concept to the people of that day. I suspect that for the people hearing it that particular day – it was either their first time hearing the concept or it was a fairly new revelation that they were still attempting to grasp. Our Father, which art in heaven – Jesus is affirming that there really is a heaven – a heaven to gain and a hell to shun. Jesus spoke of heaven and hell many times during his ministry. He was very serious about both; and therefore, I want to be very serious about both of them. In Greek, the two words we translate as “Hallowed be” are only one word. Its meaning is – Holy, pure, totally cleansed or totally clean. That verse is honoring the Lord and his name. There is a sense of: We need to keep his name holy (and with reverence) in our heart. The word “kingdom” in the Lord's prayer, and in Romans 14:17, is the same Greek word. In Romans 14:17, we learn that the kingdom of God is righteousness, peace and joy in the Holy Ghost. So when we pray, “Thy kingdom come” – I suggest that we are praying: “Your righteousness, peace, and joy – come.” We are praying that they come in our life in abundance. The word “in” in Greek can mean: in, by, with, among, at, on, or through. I like to think of it as: The kingdom of God is righteousness, peace, and joy through the Holy Ghost. I like that because I cannot attain those three things without the Holy Ghost, but only through the Holy Spirit. The word “Righteousness” in Greek means: correctness, rightness, purity of life, integrity, correctness of thinking, feeling and acting. 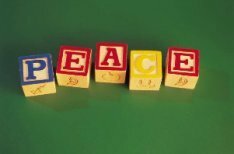 The word “Peace” in the Greek has the broad idea of: harmony, tranquility, security, safety, and prosperity. The word “Joy” means Joy. Correctness of thinking, feeling, and acting through the Holy Spirit. Harmony with the Lord – and so much more – through the Holy Spirit. Joy of the Holy Spirit which is only gained through the Holy Spirit. Since the joy of the Lord is my strength (Nehemiah 8:10), I believe that asking for joy also includes the idea of asking for the strength of the Lord to carry me through my day – so that I am rejecting sin and welcoming the thoughts of the Holy Spirit. My interpretation is a limited one. Scripture is full of many layers of revelation. Mine is just one drop in an ocean of understanding that I am submitting to you for your contemplation. Some people think that God's will is always done. God's permissive will for us. we can choose to sin and rebel against God. It is like drawing a large circle. (We each have our own circle.) All the space inside my circle is God's permissive will for me. I can choose anything inside the circle, but I cannot go outside the circle. The outside of the circle is marked "C". 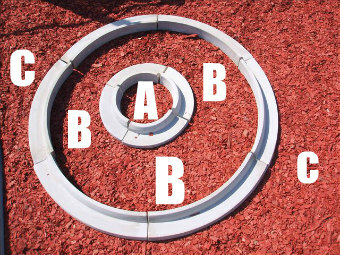 The inside of the circle is "B" and "A". I can choose anything in "B" or "A" but "A" is the perfect will of God. I cannot choose anything outside the circle which is the "C" area. I cannot go past his permissive limits - meaning I cannot go outside my circle. But there is a lot of freedom inside my circle. There is freedom to do God's perfect will (which I show as "A"). Or I can be rebellious against God and choose against God by choosing something in "B" and thereby sinning. I can sin inside my circle. But I cannot go past God's permissive limits which is the "C" area. Again, there is one place ("A") inside the circle, and that is God's perfect will. God's perfect will is often not done. There are many scriptures that illustrate this idea. The one I will use to back my belief is the story of King Saul. God did not want his people to have a king. Yet the people were insistent. It was not God's perfect will for them to have a king, but it was in his permissive will. From that story, I glean that if we are persistent and rebellious against God's will, we frequently get our own way, yet we will later regret that we got our own way. but it is always done in heaven. When we ask for God's will to be done on earth as it is in heaven, we are asking that what is permitted in heaven - be permitted on earth and what is not permitted in heaven, not be permitted in earth. So we live our life in the permissive will of God with the daily choice to seek to pursue his perfect will or seek to pursue our fleshly will. It is our mission to merge our will into his will so that our life will more and more be a display of the perfect will of God. We never arrive, but we are called to begin the journey and to move forward in the journey. Meaning: Thy will be done, (in me) on earth as it is in Heaven. or: Thy will be done on earth (in me) as it is in Heaven. In the Lord's prayer, we are saying that we want God's will done in our life, and we want to help promote God's will in this world. We are dedicating ourselves to doing things that are righteous. We are dedicating ourselves to thinking righteous thoughts. We are dedicating ourselves to spending our money on things that are righteous. We are dedicating ourselves to promote righteousness and hinder and stop unrighteousness. 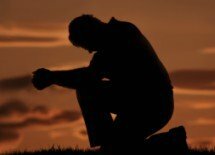 When we pray the Lord's prayer, we are dedicating ourselves to things like voting for the candidate who is advocating righteousness instead of sin. That can be rather complicated sometimes to figure out. Yet we are called to vote for righteous candidates if they are running - or for the candidate which is least dedicated to sinfulness. so people can see what the Bible truly means. Part two is called "Our Father Prayer" because many people call the the Lord's Prayer - Our Father Prayer. You can click "Our Father Prayer" and go to Part Two.